Google Translate has a new design and some new features. The service translates your text as you type, so you no longer have to click on "Translate" every time you edit the text. Getting real-time feedback helps you improve the original text and get a better translation. 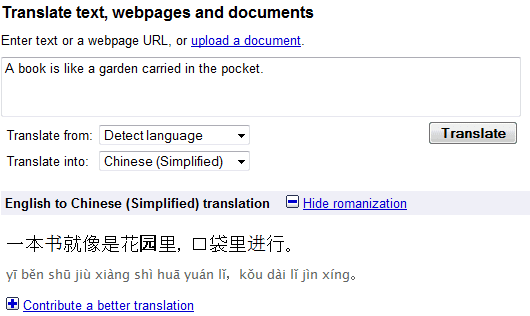 If you translate a text into English, Google has a text-to-speech service that lets you listen to the translation. Google has improved the translation service for non-Roman languages: you can now read Chinese, Russian, Greek, Hindi, Korean, Thai or Japanese texts written phonetically in English. There's also a transliteration feature for Arabic, Persian and Hindi. 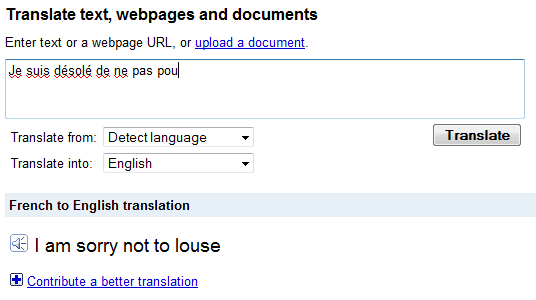 Google Translate is now accessible from Google's homepage: you can find it in the "more" navigation menu. The service has been added to most international Google homepages in March and now it's available at google.com. You can also type an URL and then Enter, you are redirected to a translation of you web page. Great! The Chinese translation is so poor that even a native speaker can't read it. Chitsaou... The Persian Translation has this prob too!. I'm thinking of using this to learn Spanish. any idea how accurate the translations are? I was playing around with the real-time translation and entered "The quick brown fox jumps over the lazy dog." The Spanish translation came out as "La cigüeña tocaba el saxofón detrás del palenque de paja." which looked a little weird. Translating back to English, the result is "The stork played the saxophone behind the lazy dog." Absolutely hilarious, thank you Google! anyone know of a service that allows me to type in english like i am doing now but instead translates it as im typing it?